When you’re headed out to a rugged mountain trail, you don’t want to rely on smooth road pedals that your feet could slip off of, leaving you with a complete lack of control. Instead, you have to choose the best mountain bike pedals that will give you the traction you need to keep your feet in place on the pedals where they should be. With a few different types to pick from, all with a variety of features, it may be a difficult choice. That’s why it is important to know the pros and cons of each type of mountain bike pedal, and which features are the most important. When deciding which are the best MTB pedals for you, first you need to know what kinds of pedals are made for this particular type of biking. Platform Pedals: These are also called flat pedals and most beginner mountain bikes are equipped with them. The advantages of this type of pedal is that you don’t need to buy special shoes for them because they can be used with any type of shoe that has a flat bottom. These types of pedals make it easier to bail off the bike if the need arises, a necessary feature for beginners as well as experts in downhill or dirt jump races. Platform pedals are also cheaper than other types of mountain bike pedals. Because these pedals are lighter and grippier than ever before, some riders find them to be as stable as clipless pedals. Clipless Pedals: This type of pedal comes with special cleats that you attach to shoes designed specifically for mountain biking. The cleats are put into the shoes and are then used to clip into the pedals themselves for a secure grip and total control over the bike. These can be a bit tricky to get used to for beginners, but once learned, they can have some advantages over other pedals. Firstly, they offer improved efficiency by keeping the energy flowing directly from your leg to the pedal with each stroke. These pedals also give you superior handling on technical rides by keeping your feet firmly attached to the pedal even over bumpy routes. The best clipless mountain bike pedals are also lighter and smaller than other pedals, which means they scrape less on rocks or other obstacles in your path. Combination Pedals: Combo pedals are the best of both worlds, giving you the larger platform on the outside with a clipping mechanism on the inside. There are two types of combination pedals, one with a clip on only one side and a platform on the other side, and another type that has the clip included with the platform on both sides of the pedal. These pedals tend to be a bit larger than the other styles, with a tougher clipping process than with clip-only pedals. This is because the clip side on the first type tends to be heavier and rotates to the bottom of the pedal when not in use. This will make it more difficult to clip into them while riding. Of course, for those who use their bikes for multiple purposes, for instance as a road bike as well as a mountain or racing bike, these may be the best choice, since you won’t always want to be clipped into your pedals, especially if in normal flat shoes. Whichever type of pedal you choose, be sure they have the following features to keep your mountain biking enjoyable. Durability: When mountain biking, there are always going to be rocks, rough ground, and even shrubbery that could come in contact with your pedals during a ride. Your pedal will need to withstand the abuse these obstacles may inflict on them, so make sure you choose a strong, solid pedal with smooth bearings. The less maintenance they need, the more fun you can have with them. Maintenance: Some pedals come with removable parts that can be changed when they wear out or break. Others require a brand new pedal when they wear out. Though it may take a bit of time to take your pedals apart and swap the necessary parts, it may be cheaper in the long run to do this. And why throw away a perfectly good pedal because of one small worn out part? The Weight of the Pedal: Though you want to find a lightweight pedal, be sure they are made of quality materials so you are not sacrificing durability. You want your pedal to last a long time on rough trails, so don’t focus just on weight. Shedding Ability: Make sure your pedals have open spaces throughout, so any mud and debris that could collect can be pushed out using your feet when riding, or with your hands when stopped. This will help your feet to stay firmly on the pedal where they belong, instead of having layers of gunk or snow compromising your traction. Adjustment Options: There are two types of adjustments to look for in a clipless pedal. The first is the pedal tension settings, which refers to the amount of force you will need to clip or unclip your shoes from them. The second is the float adjustment, which is the range of motion you have when rotating your foot while it is clipped in. The more adjustability you have, the better the pedal. Description: This durable set of Shimano PD-M530 MTB SPD Pedals withstand the beating of rocks and other debris when on rugged trails without the slightest wear. It is simple to clip into these pedals, and the small platform surrounding this mechanism gives you more room for your feet when you need to stand up while riding. This feature also keeps the pedal from spinning around before you are clipped in, so your feet stay on where they belong. The platform is as easy to exit as it is to clip in. The spring tension adjustment is versatile, offering you levels that range from very soft to quite firm, and can be adjusted using a 3mm Allen key. Installation is also simple, requiring either an 8mm Allen wrench or a standard pedal wrench to tighten it. The integrated cage sheds mud easily with minimum buildup in your pedals. Though a bit heavier than some other pedals on the market, the low price makes these hard to beat. Related: There are two pedals by Shimano that are similar to the M530 SPD model. These are the M520 SPD and the M540 SPD. All three have the same adjustable entry and release tension settings, the same shedding ability with mud and other debris, and the same low-maintenance sealed cartridge axle. The difference is that the M530 is the heaviest pedal of the 3, but this is due to the wide platform that offers you more control and stability when you aren’t clipped in, making the bit of extra weight a very minimal concern. Description: The Mallet 3 mountain bike pedals are a lightweight platform body combined with the Crank Brothers’ popular 4-sided pedal system that is easy to clip into. The platform body has 6 adjustable pins on each side of the pedal to give you the stability and control you need on a larger surface area. The pedal’s open design sheds mud and rocks that may otherwise collect and jam up your cleats. The stainless steel and forged chromoly components are durable, strong and reliable enough for the most rugged terrains. The pedals rotate smoothly on the needle and cartridge bearings. Included with the pedals are premium brass cleats that give you 6 degrees of float. When ready to dismount, or you just need to put down your foot for a bit of support on a turn, there is a 15 or 20 degree release angle to disengage your cleats, depending on your preference. These stylish pedals come in black, black and green, and black and red, so you will always be able to match them to your chosen bike. Related: The Crank Brothers Mallet 2 Platform pedals are similar to the Mallet 3 in many ways, including the flat pedal feet, aluminum platform, bearings, double seal system, and 4-sided entry. The Mallet 2 is a bit heavier, though, at 508g per pair, and they do not include the 6 adjustable pins that give you added stability. They are still a great set of pedals, but not as easy to control on rougher terrain as the Mallet 3 set. Description: The wide, stable platform of the Mallet Race pedals give you amazing control on rugged and demanding downhill racing courses. The stainless steel wing is strong and durable, with a corrosion resistant finish. It has 8 adjustable pins on each side, giving you the traction and control you need on rougher trails. The two-piece body is made of machined aluminum that is both stiff and lightweight. With a 4-sided entry engagement, these pedals shed mud and rocks that may clog it otherwise. The premium quality brass cleats and shims are included with these pedals, so you always have the right fit. The float and release angle are both customizable at either 15 or 20 degrees. The needle and cartridge bearings keep your pedals rotating smoothly. These pedals are priced at around $90.00, and though it seems like a hefty cost, the durability and efficiency of the pedals make them well worth the cost. They come in either black or red, to suit your stylish needs. Related: Though there are a few other Mallet pedals available for enduro racing and riding, these are the only ones designed for the downhill racers. Description: The X1 clipless model were designed to give downhill racers a secure pedal that is durable enough to handle the rougher terrain. Though the CNC-machined aluminum body is strong and capable of taking a beating on a rocky terrain, they are still light in weight. The replaceable pins on the sides of the pedals add strength as well as giving you added traction. The 4.5 degree float feels much less than that for those riders who have become accustomed to more movement on the pedals. The high spring tension ensures your feet will stay where you place them, even on the roughest courses. The tri-sealed bearings keep your pedals rotating smoothly, and the cleat system used on these pedals are exclusive to HT. Though a bit heavier than other brands, the durability of these pedals make them worth the extra weight. They are priced a bit high at $169.99, but avid riders may find them worth the money. These pedals come in a wide variety of colors, including black, silver, orange, gold, red, grey, apple green, and two shades of blue. Related: HT makes a wide range of pedals for a variety of uses, including the X2 for Dirt 100 racing and the X2-SX for BMX racing, both of which are similar in make and materials to the X1. Both weigh a bit less at 460 grams, so if this is the type of riding you prefer, these might be better options. But for downhill racing, the X1 is the best choice. Description: Though these Shimano Unisex PD-M520 MTB SPD Pedal come with a set of SM-SH51 SPD cleats, the M520s are also compatible with Shimano’s SM-SH56 SPD cleats, so you can choose which ones work best for you. These pedals are super-compact and lightweight, and are made of durable materials that will last for years of hard riding. The open binding mechanism sheds mud and other debris easily so they don’t jam up while you’re riding, making it difficult to clip in and out. The entry and release settings are adjustable using an Allen key, so you can open them a bit more while learning to clip in and out, and tighten them again as you gain the confidence and experience needed for easy and quick release. The sealed bearing cartridge axle requires minimal maintenance, keeping out any water and mud so it always rotates perfectly. At only $32.00, these pedals are well worth their low price, without sacrificing quality. 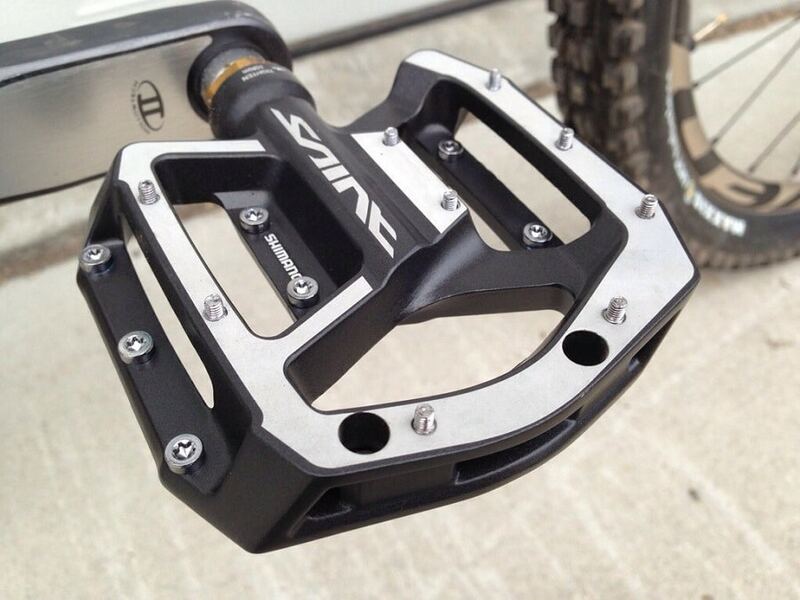 The Shimano M520 mountain bike pedal comes in black or silver. Related: The closest models to the M520 SPD mountain bike pedal are the M530 and the M540, both of which are discussed above. Description: These sturdy Shimano PD-M647 Clipless Pedal with Outer Cage are designed to withstand the rough treatment inflicted on them during BMX and off-road racing. They are made of aluminum with an anodized finish to resist scratches and corrosion. The cleats have a tension adjustment that can be easily changed to suit the needs of each rider, from beginner to expert, with adjustment indicators so you always set it perfectly. The pop-up bindings are dual-sided with a spring loaded platform that positions the body at 12.5 degrees for quick and simple clipping. The top end axle and bearings keep your pedals rotating smoothly throughout your ride, no matter what the terrain or how hard you are on them. The open design allows the pedals to shed any debris and mud that may try to collect in the spaces beneath your feet. Included with the M647 pedals are a set of two-bolt SPD cleats. Though a bit heavier than some of Shimano’s pedals, the durability of this set makes them well worth the extra weight and higher price tag. Related: Though Shimano has a few other pedals designed for either BMX or off-road racing, this is the only one that is perfect for use during both types of riding. Description: The durable materials of these lightweight Crank Brothers Eggbeater 2 Pedals include a cast stainless steel body, spring, and wings with a steel spindle, all of which can stand up to a great deal of hard riding. The four-sided entry keeps your pedals free of mud and other trail debris that may otherwise collect in the pedals. You’ll never have to look down when it comes time to clip in or out during your ride. The low-profile Eggbeater design keeps your pedal strokes efficient and powerful, so you don’t lose speed or control when on the trail. The float is adjustable, with either a 15- or 20-degree release angle, depending on your preference. The igul LL-glide inner bearing and the enduro cartridge outer bearing keep your pedals rotating smoothly. Included with the Eggbeater 2 pedals are a set of premium brass cleats and shims, so you will always have the proper fit. These black pedals are priced at about $72.00, and are the world’s lightest mountain bike pedals. Related: The Eggbeater 2 pedals are similar in design and most of their components as the Eggbeater 1 and the Eggbeater 3 pedals. The Eggbeater 1 is the heaviest at 290 grams, has a stamped steel body, but is the cheapest of the three. The Eggbeater 3 is the lightest at 280 grams, has more color options, but also carries the highest price tag. All are meant for the same type of riding, so it may come down to how much you are willing to spend when deciding on the right set of pedals. Whether a beginner or an expert on a mountain trail, having the right equipment can keep you stabilized and safer during a rough, bouncy ride. The right pedals may seem like a small thing to think about, but they can give you the traction and control needed on any course or racing trail, and keep your feet where they’re supposed to be. With so many pedals to choose from, we may have missed a good one, so if you think there is a great mountain bike pedal available that should have been included on our list, please let us know in our comments section.